Extra Notes: Fantastic on a salad or with pasta. The extra oil can be used for dressings, cooking, or for marinating other kinds of cheeses. The herbs are peppercorns, bay leaf, and other herbs. 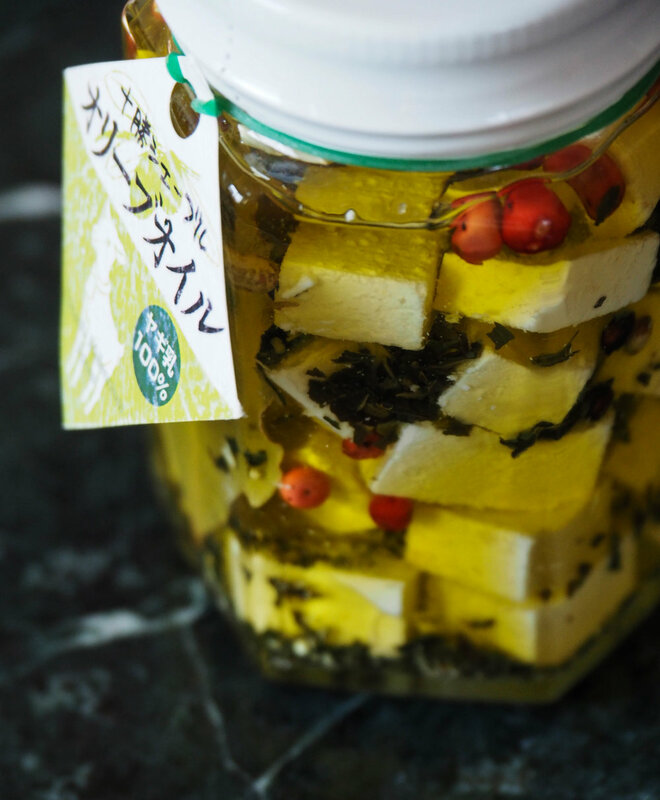 This is a beautiful jar of goat cheese marinating in olive oil with a bay leaf, peppercorns and other herbs. The colors of the ingredients make it as visually appealing as it is delicious. It is made from the milk of Saanen goats living happily on Ran Ran Farm. The farm is an important part of the efforts at Tokachi Millennium Forest in Hokkaido. This goat cheese is unique because it doesn’t have the distinctive “goatiness” of most chèvre cheeses. This is an intentional feature intended to increase the appeal of goat cheese to the wider Japanese audience. On average, the Japanese consume very little goat cheese. It’s widely understood that the average Japanese person doesn’t care for “goaty” flavors and smells. Only made from April to December, this goat cheese is a seasonal treat that can be enjoyed on salads, pastas, or even straight out of the jar. For more information, check out the blog post on Tokachi Millennium Forest’s Chèvre in Olive Oil here.